If you don’t have the time and money to get an old Sprinter van up and running–and trust us, van life is cheap once you’re on the road, but it can be a huge financial undertaking to get started–these rental companies have a solution. Whether you’re in the market for a wildly painted camper van, a rugged teardrop trailer, or a classic white Sprinter, one of these family-run companies will have what you’re looking for. Some of them will even stock the fridge with beer before you get there. In 2003, three buddies from New Zealand founded the colorful Escape rental service, which expanded to the United States in 2009. Their vans come custom-painted by one of many collaborating artists, and you can pick up your vehicle in Los Angeles, San Francisco, New York, Denver, Miami, or Las Vegas (or, for that matter, in New Zealand). Popular with travelers visiting from abroad, Escape offers plenty of travel advice, from proposed itineraries to helpful tips like which side of the road you should be driving on. Get a quote here. Lost Campers USA rents out of Los Angeles, San Francisco, and Salt Lake City. Founded by Australians Emma and Nick Thomson, the company’s fleet of 120 vehicles connect their customers with the lifestyle they love: camping in the outback, road-tripping across the United States. These adventurers are exactly the kind of people you want behind your next big trip. Lost Campers prioritizes a low-profile vehicle, one that doesn’t stick out as a rental at your new favorite surf break and could be parked surreptitiously in a national park lot. Add one of their rooftop tents, and you’ve got the ideal vehicle for a family road trip or an adventure with friends. From $60/night. Off the Grid Rentals offers teardrop trailers and rooftop tents out of Mesa, Arizona and Laguna Hills, California. Specifically built for off-road terrain, these towable living spaces are tougher than they look. Founder Nizar Najm, a father of three, wanted to give his customers access to luxury camping tools like their trailers and tents, as well as fridges, freezers, and compact generators, without having to deal with the costs of ownership. Though the business idea was sparked during a family camping trip, these rugged camping trailers are definitely worthy of your next big friendventure–they’d be perfect for a week of climbing in nearby Joshua Tree. From $100/night. These companies take the AirBnB model and apply it to adventure vehicles. From perfectly stocked livable camper vans to classic RVs and trailers, you can find just about anything you need. Trailer Made also connects their users to primo camping sites on often-private land that other members own or manage and rent out to enterprising travelers. Outdoorsy emphasizes the benefits of peer-to-peer renting: when you’re renting a livable van from another outdoorsperson, they might have a kayak or two they’ll throw in for an extra $100. Got a dog? No worries–with so many options, you’re bound to find the right, pet-friendly person to rent from. Marc and Vicki Rittner founded Eat Sleep Go after they fell in love with a Mercedes Roadtrek RS Adventurous and realized how expensive (and convoluted) the process of becoming an owner could be. Based out of San Dimas, California, the couple decided to offset the cost of their dream camper van with a private rental service. While their fleet is just one Sprinter, the couple has built a broader community of Sprinter owners and renters, in which people share advice on renting, refurbishing, and general van life. From $1,490/3 days. Adventure Rigs was founded by four adventurous friends in Jackson Hole, Wyoming. If you need advice on where to take one of their badass vehicles–nicknamed Norman and Frank the Tank–the fun-loving owners will definitely be able to help you out. From $2,550/week. Adventure Travel Sport Rentals, out of Golden and Boulder, Colorado, rents livable vans, trailers, and hardy rigs (including Sportsmobiles, Toyota Land Cruisers and Jeep Rubicons) to get you into the mountains safely. From $130/night. Airstream Coach offers loyal customer discounts for the regular vagabond. Pick up your Airstream van in Laguna Niguel, California. From $250/night. Basecamper Vans, out of Salt Lake City, has a wide selection of camper vans (and one trailer!) Ask ahead and they can have your rig stocked with groceries and booze before you arrive. From $79/night. Campervan North America offers five models of Campervans for rent out of Seattle, Bozeman, and Las Vegas. With an eye toward stewardship and conservation, Campervan donates one percent of their profits to environmental nonprofits. From $85/night. Jucy Rentals is another New Zealand-based company, which rents bright purple-and-green “mini RVs” out of San Francisco, Los Angeles, and Las Vegas. From $45/night. Mercedes Sprinter RV Rentals has 29 locations across the American West. Customers can pick up one of their Mercedes camper vans and head off into just about any national park in the country in a matter of hours. Bonus: 10 percent of their proceeds go to the National Parks Conservancy. Get a quote here. Tonto Trails offers Sportsmobile and Tiger Expedition Vehicle rentals out of Durango, Colorado. Customers can opt for a guided trip, including pre-planned activities, no need to navigate, and cocktails and group dinners in the evenings. From $1,000/3 nights. 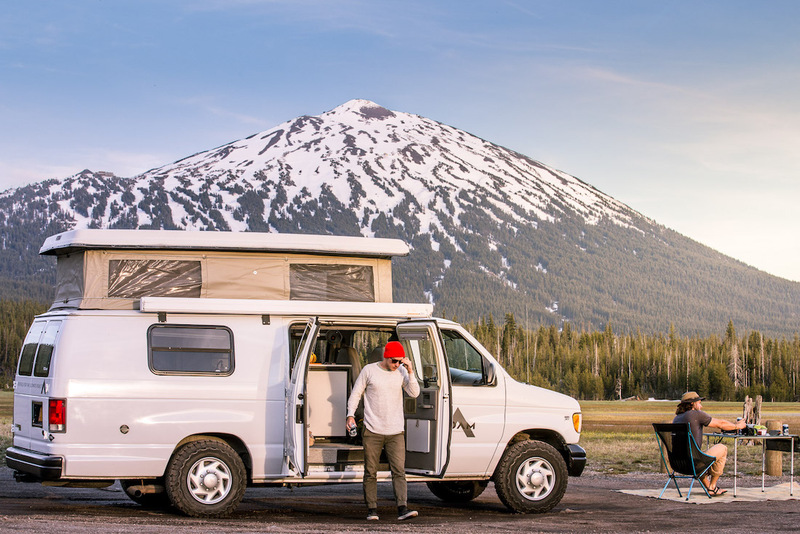 Wander Vans, based out of Boise, Idaho, offers fully equipped, low profile camper vans to get you out of Idaho’s urban center and into the wild land surrounding it. Outdoorsy owner Chris Cook will advise you on his favorite spots if you need any help planning your trip. From $95/night. Note on rentals and rates: Some of these companies don’t include insurance in their daily rates. Most rental services will equip you with everything you need in the kitchen and provide bedding as well. Others will set you up with tents, sleeping bags, headlamps, and other adventure gear. Keep an eye on the amenities as you plan your next adventure! Photo by Mike Branscum, courtesy of ROAM. I would recommend including Vintage Surfari Wagons out of Costa Mesa, CA on the list. We just got back from a trip up Hwy 1 to Big Sur in a 1978 VW van and it was amazing! You also missed Wandervans based in Boise,ID. Check out our website at http://www.wandervans.com. If you want something off the beaten path then Idaho is your place to leave the crowds behind. Considering the continent North America encompasses Canada I wish you would include some Canadian company’s in your article, The best camper van rentals in “North America”. A bit misleading or poorly written article. I guess nobody camps east of the Rockies, aye? Are there any small campervan rentals in New England? Mainly MA, RI, or CT. Boston appears to be a location for very few companies, but nothing is available. Cruise America seems to be the one and only option. Another to add to your list! http://www.outervan.com! We offer handcrafted campervan rentals in the bay area. Tahoe, Yosemite, Big Sur it’s all in our backyard! Want to rent in Alaska? We have just come back from an trip that was truly awesome (surely that should be the definition of Alaska in the dictionary?). A big part of this awesomeness was the van we rented from Alaska Camper Van Rentals (http://www.alaskacampervanrentals.com/). We didn’t want a big RV (ugh!) but had sifted through all the usual big-company suspects (and some smaller unusual ones) and weren’t convinced that we would be looked after. Luckily, one of the other small Alaskan companies (who only did two-person sleepers – we are a family of four) recommended this small, family-run company and the experience was great from first contact to refund of security deposit (a standard requirement just like with hire cars). The vehicles come fully kitted out so you can enjoy your vacation instead of lugging equipment around, are reliable, versatile and great to drive…. actually we had lots of locals asking where we rented from so they could recommend them to their visiting friends! The kids shed a tear (really) when we had to hand it back. If you want a company you can trust to take care of your needs, who make their agreements simple and clear, and who are genuinely interested in you having a great vacation, give these guys a try. Does no one in ga rent vans? Highly recommend Escape Campervans. Recently drove the Ca coast and really enjoyed the van. Really nice folks! We had an awesome trip over 3000 miles from South Dakota, Wyoming, Idaho, Utah, Arizona, and Colorado!